If, like me, you have fond memories of commanding hordes of the Undead and moving miniatures about on your best friend's dining room table, then you'll likely be excited to hear that the Tomb Kings (the second offshoot from the larger "Undead" category) will be added to Total War: WARHAMMER 2 in January via paid DLC. This is the first new playable race that is getting added to the game after its September release. 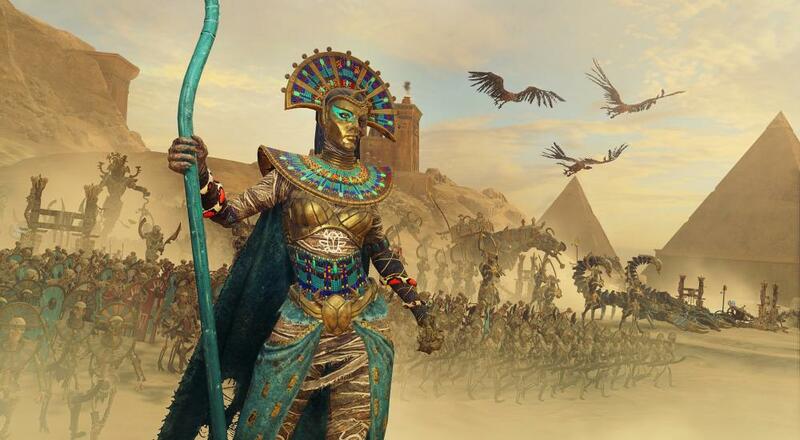 Unlike the Wood Elves or Beastmen that were added to the first game, Total War: WARHAMMER, the Tomb Kings won't have their own story campaign to play. Instead, it appears that they're getting more Legendary Lords (4 instead of 2) than the other races, and within the "Eye of Vortex" campaign of Total War: WARHAMMER 2 campaign, the shambling hordes have a different goal than everyone else. The Tomb Kings care not about that giant swirling vortex and instead are focused on finding and recovering the Nine Books of Nagash. Each book grants the Tomb Kings a campaign bonus, though what those may be haven't been revealed, and all of this culminates in a battle at the Black Pyramid of Nagash. Like the rest of the races in Total War: WARHAMMER 2, that's not the only unique mechanic that the Tomb Kings will bring to the game, and full details can be found over in the Creative Assembly blog post. The "Rise of the Tomb Kings" DLC will arrive January 23, 2018. It is available for pre-order at a 10% discount on Steam. Total War: WARHAMMER 2 is available on PC via Steam and supports two player online co-op in the Eye of Vortex campaign (and Mortal Empires campaign, provided both players own both games), and it supports up to four player online co-op in the Multiplayer mode as you take on A.I. controlled opponents.